Happy, happy, happy is how I felt after completing the amazing Mist Trail. Hiking in November meant that Andrew and I didn’t get to see the spectacular show of water spewing forth from the featured falls. We also didn’t get wet, the trail wasn’t slippery, and the crowd-factor was minimal. I am highly impressed with our National Park System’s maintenance of this heavily traversed trail, one that thousands of people hike each year. Walking from the parking lot to the trail. It was a cold morning as we began our walk from Curry Village, where we left the car. The trailhead was a mile beyond at Happy Isles. 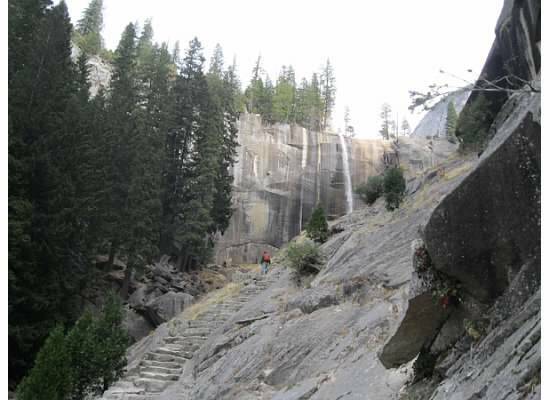 The one thousand foot climb to the precipice of Vernal Fall began at the trailhead. Look at all of the places that are accessible from this point. 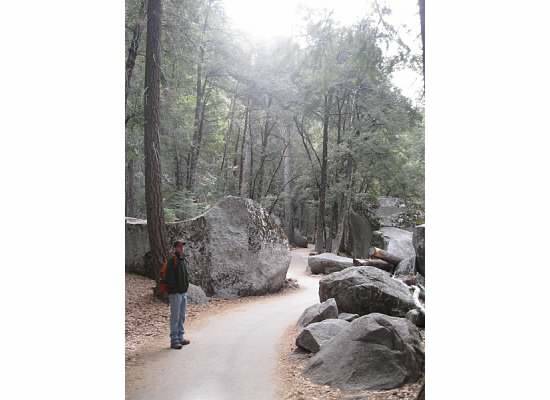 At the trailhead, a paved walkway lined the way for almost a mile as we walked under a canopy of trees and through a boulder garden that was undergoing renovations. The park is restoring the lichen and moss growing on the boulders where vandals have carved initials, words, and symbols called “eco-graffiti”. The short uphill jaunt continued until we reached the vista point at the bridge. The view from the bridge was the first chance we had at seeing the massive Vernal Fall. What we saw instead was a massive, water-stained granite wall and a narrow ribbon of water spilling over. 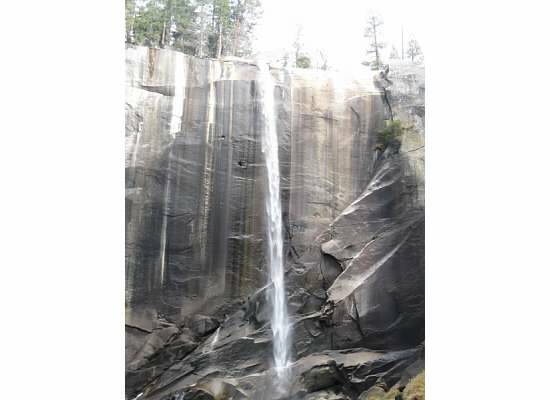 At its capacity, Vernal Fall sprays the trail like rain from a torrential downpour. 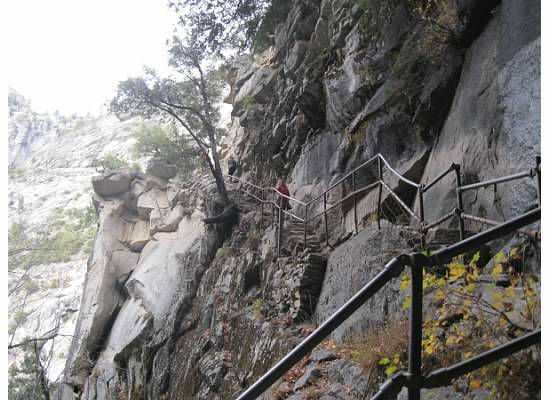 The remainder of the trail to the top of the fall was a granite staircase. Vernal Fall crashing onto the boulders below was mountain music that accompanied us up the granite staircase. As we climbed higher I thought of all the people who had died there, and said a prayer for them and their families. This was the last I saw of Andrew until we met at the top. Each step was deep enough to fit my small foot. Some steps were steep, but for the most part, it was a comfortable climb until the last section when I happened to looked down. Two hikers climb the last section of steps. The image doesn’t do justice to the actual feel of being there. The last set of steps were protected by a guard rail. I used the guard rail as a handrail until it veered away from the steps. Upon reaching one of the steepest steps of the day, I stopped and looked over the cliff, then froze with fear and couldn’t move. My hands began to sweat. 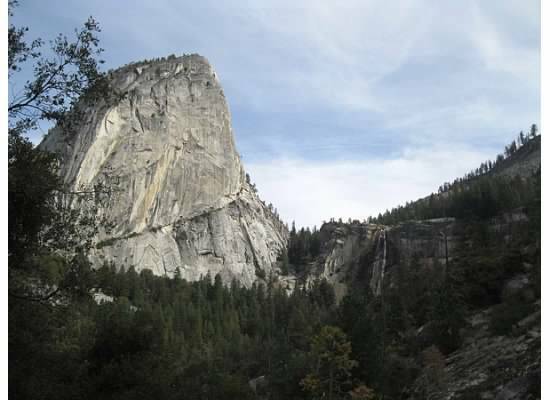 Keeping my eyes towards the wall, I climbed up the boulder-sized step bruising my shin and bumping my head on the granite wall in the process. Once I was up the step and mentally back on track, I quickly caught up with Andrew. At the top of the waterfall we watched a woman climb over the guard rail and walk down to the water. Even though the water was low, I wanted to shout at her to stop, that dozens of people have been swept away after climbing over the rail. The sign warns of danger as a woman, so close to the brink of the fall, climbs over. We found a pleasant spot near Emerald Pool and ate lunch before continuing on the path uphill. 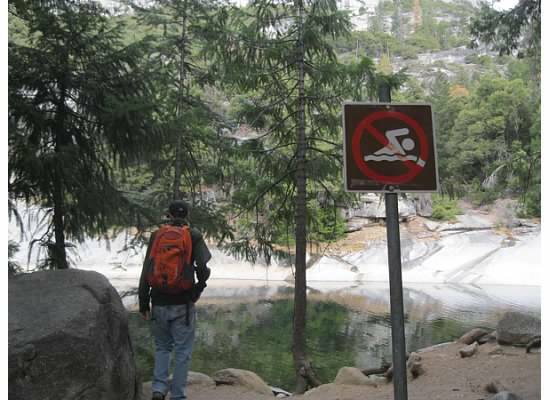 Another warning sign at Emerald Pool not to swim here. 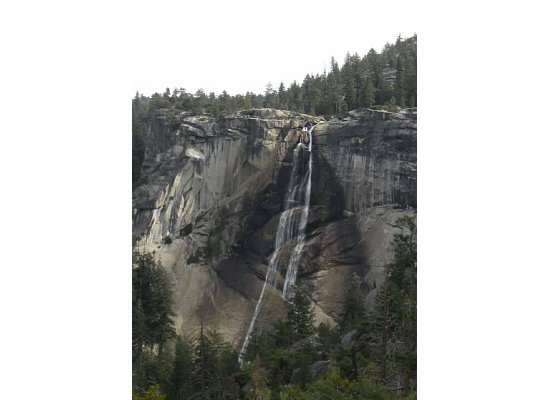 We passed water cascading down rocks like a water slide known as Silver Apron, then Nevada Fall came into view. 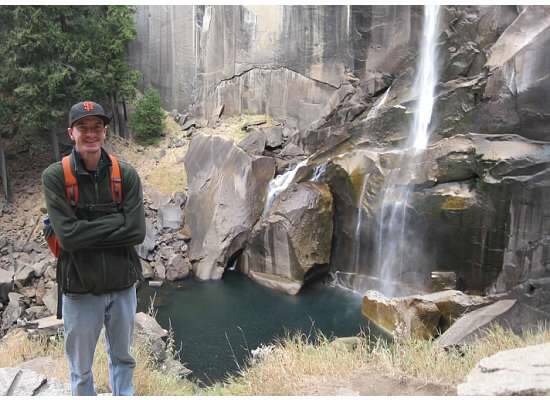 Nevada Fall, one mile up the trail, was just a thread of water. Through a series of switchbacks (another three hundred foot climb), we reached Clark’s Point, Andrew’s favorite spot on the trail. The view from Clark’s Point was outstanding. We saw Grizzly Peak, Mt. 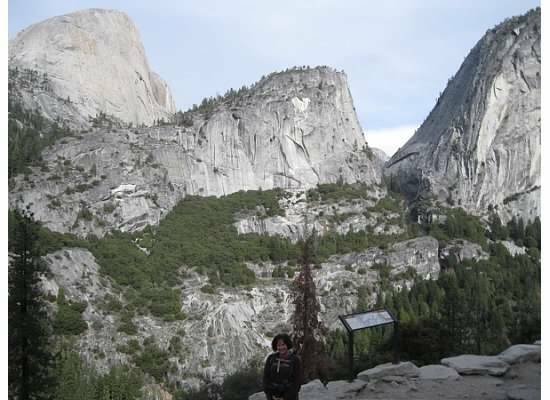 Broderick, and Liberty Cap as well as the back of Half Dome and Nevada Fall. 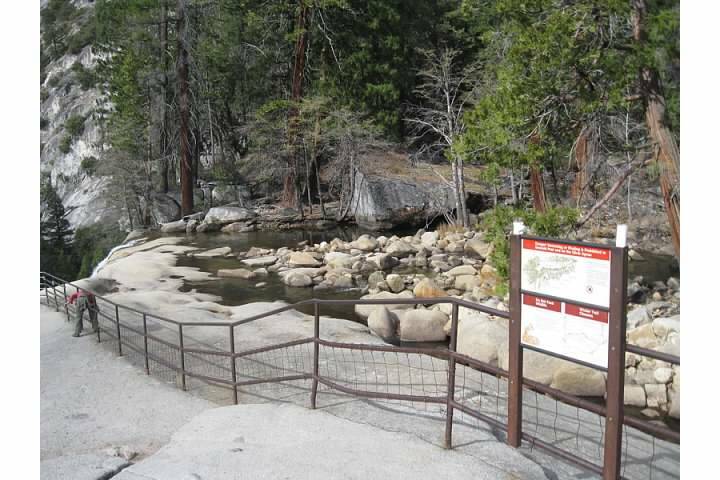 Here, the trail intersected with the John Muir Trail (JMT), our return path. The JMT led us downhill and around a dozen switchbacks. Getting ready to descend via the longer but easier route, the JMT. 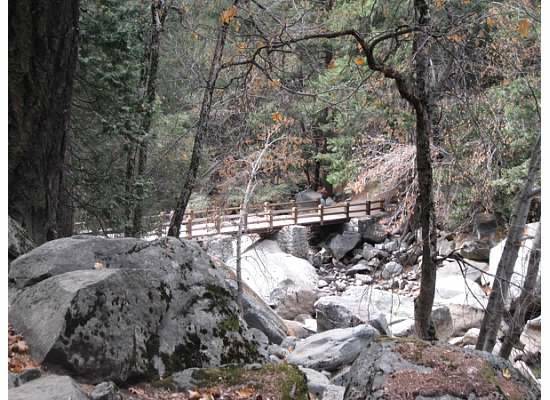 At one point we walked through an area that appeared, by evidence along the trail, to have been effected by a rock slide . 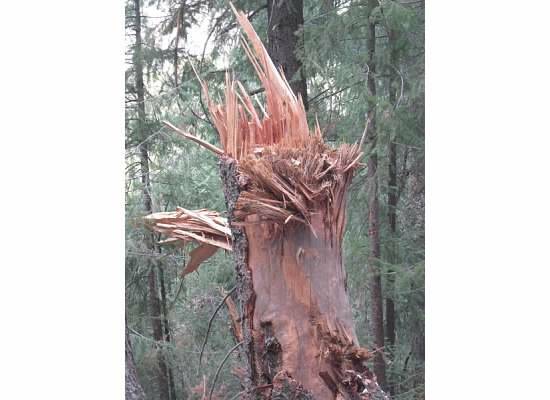 A splintered tree damaged by what appeared to be a rock slide. 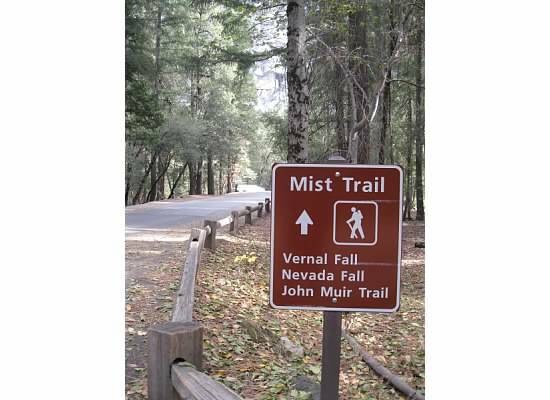 The JMT eventually connected with the paved Mist Trail where we retraced our steps to the car. This trail was challenging but doable, and the conditions were excellent. It’s a hike that I would like to do each autumn. 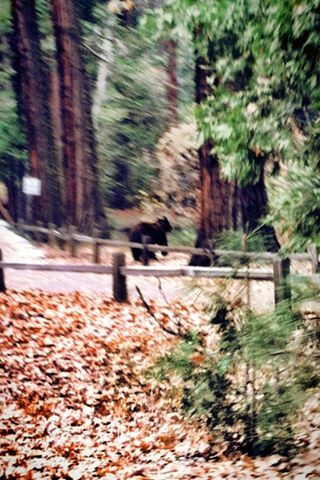 As an added bonus, we saw a bear! The tagged bear ran in front of the car as we drove out. Image taken with Andrew’s cell phone. 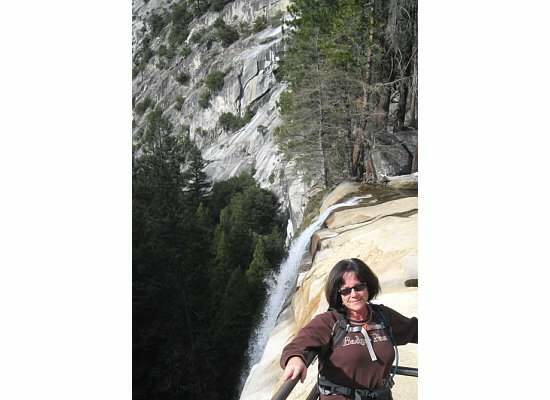 This entry was posted in Yosemite Hikes and tagged Hiking, Liberty Cap, Mist Trail, Nevada Fall, Vernal Fall, Yosemite, Yosemite National Park on November 20, 2013 by Janet. Janet…ANOTHER GREAT BLOG and PHOTOS. I’ve seen many pictures of the Mist Trail and they always look different and never lose their beauty. I got the willies just looking at some of the steps. Even if I was in shape I don’t know that I could climb them. I Know I’d be scared to death to even try it if they were wet. I started this post with the words, “happy, happy, happy”. 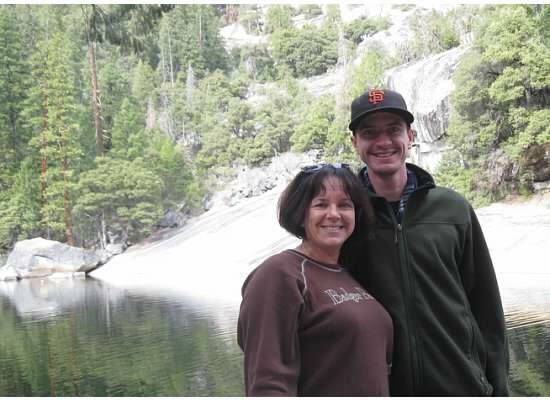 One “happy” was because I hiked the trail 17 years ago in April with our two oldest kids and a few other people. It was wet then, and I didn’t go to the top. I stopped at the base of the fall. I remember being so out of shape even though I was lighter in weight and younger. I could hardly walk the next day. But this time was different, it was so much easier…and that made me happy. The lack of people there was very nice. The times we went in Sept. still like a ride at Disneyland, well not really but let’s say you picked a good time to go. I’m with you on the JMT. Much easier on the body. 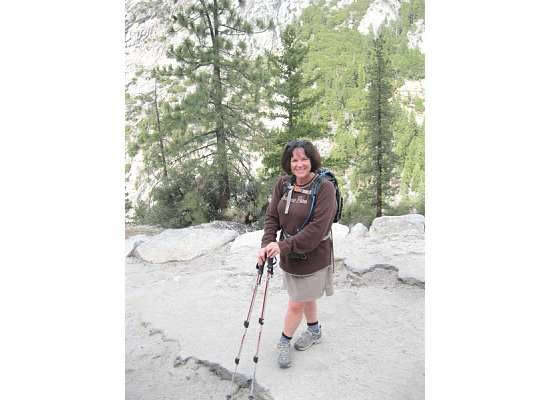 Cathy, next time we’ll hike farther. This time Andrew wanted to get back for the Monday night football game. 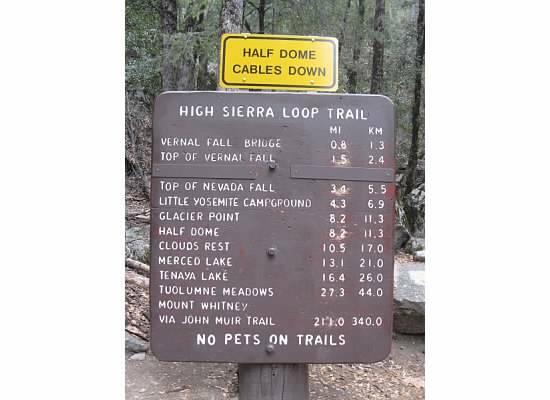 😦 I don’t think I’ll ever hike the trail during peak season, although I did do it in April 1996. The trail looks awesome, and the scenery is breath-taking. I find heights challenging sometimes, and think that I’d also find it hard to concentrate if the handrail veered away from the steps. .
this post had everything–danger, safety, beauty, even a bear! your picture of the winding guardrail convinced me of the perilousness of the climb. what bravery–good for you!